The rain is bucketing down in north county Dublin today. I am sitting in a small studio, tucked into the bottom corner of Lynder’s Mobile Home and Camping Park on the edge of Tower Bay, Portrane, listening to the blustery wet of the day. My fellow artist, Wendy Judge, is busily editing photographs she has taken down on the beach. The clicks she makes on her laptop sound like slow irregular drips after a downpour. The tappings I make on my own keyboard sound more like a drizzle-storm in a tea cup. The Irish summer has returned, gale force. Myself and Wendy are part of Difference Engine, along with artists Mark Cullen and Gillian Lawler. We’ve been making exhibitions together since 2009. Our approach is collaborative, improvisational, site-responsive and involves lots of different media, from sculpture to photography to painting to spoken word. We are working here as part of the fourth Resort Residency, an initiative of Fingal Arts Office since 2014. 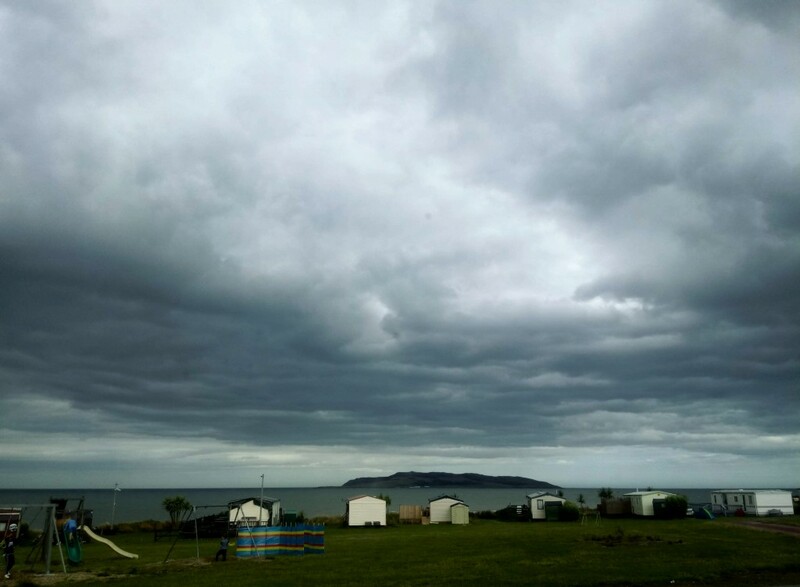 The Resort Residency offers artists a unique opportunity to develop and show work in and around Lynder’s Mobile Home Park, Portrane, and Donabate, responding to place and people in various ways. This September, Difference Engine will present work with three other artists (Bennie Reilly, Marie Farrington and Ciaran Murphy) as part of the local Bleeding Pig Cultural Festival. On this residency I’m pushing myself to practice writing a particular kind of poetry, one that I’m hoping can help me to open up a way of articulating the presence and affects of the so-called fourth industrial revolution (internet technologies, 5G, IoT, AI). In short, I am attempting to write… a nature poem. The nature poem is a mainstay of the tradition of poetry; it’s a way of thinking with and telling about the physical world and time we’re living in. My feeling is that the nature poem can work as both a foil and as a useful medium through which to appreciate and communicate the contradictions, harms and benefits of internet phenomena, from ‘smart phones’ and ‘smart homes’. Difference Engine’s contribution to Resort 2018 will comprise a site-specific maze constructed out of traditional beach wind-breakers, large scale photography, paintings embedded in the landscape, a writing workshop, and (all going well) an interactive performance of a nature poem. Resort will run from the first weekend in September for one week, I’ll keep you posted on exact dates. PS: By the way, the WiFi here is pretty weak. I may have to send this by post.